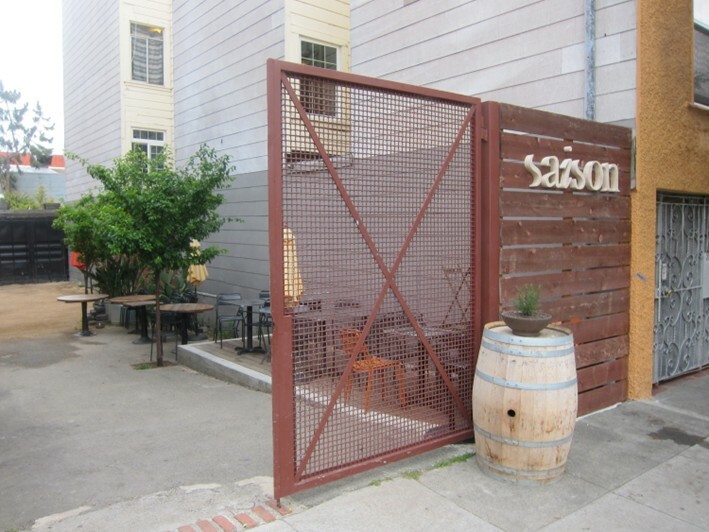 Since my last visit here Saison moved in early 2013 out of the Mission district to nearby South of Market (SoMa). The new premises is in a renovated 19th century warehouse, which also houses an apartment complex. Chef Joshua Skenes trained with Jean Georges Vongerichten while still at culinary school in New York. He moved to Boston to help open a restaurant called Troquet and worked with Anthony Ambrose at Ambrosia. 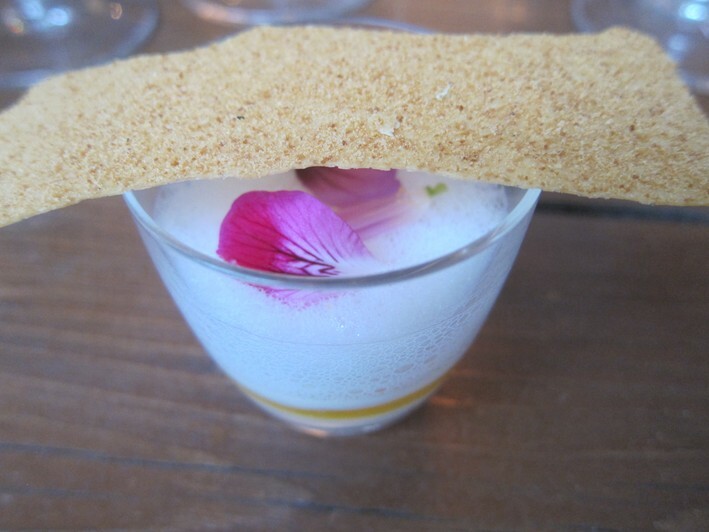 In 2003 he moved to the Bay area and became executive chef at Chez TJ in Mountain View. 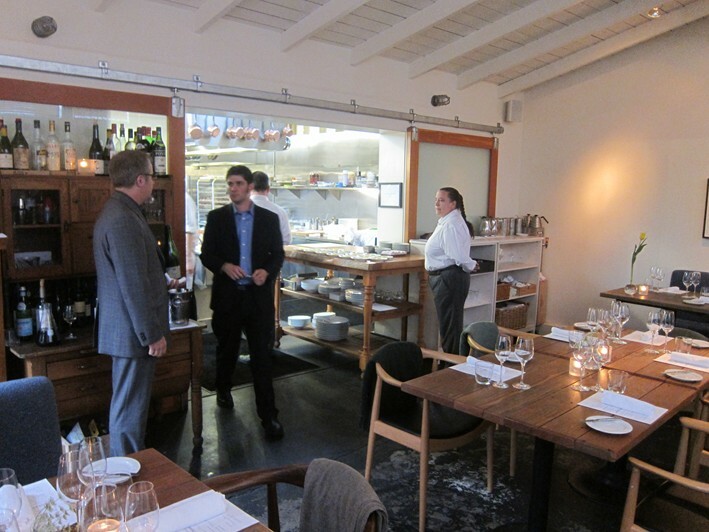 After working with Michael Mina at Stonehill Tavern in 2005 and 2006 Mr Skenes returned to San Francisco and worked as a restaurant consultant for a time before opening Saison. The new premises feature a bar area at one end of the huge barn-like space with its high ceiling, the open kitchen being at the opposite end and seating in between. As in the previous premises, a reflection of the chef’s interest in the fundamentals of how fire affects flavour can be seen in the open hearth in the kitchen, which is at the back of the dining room. Tables are well spaced, with around thirty diners being served at any one time; I counted eleven chefs working in the kitchen. The atmosphere is quite casual, with no barriers between the tables and the kitchen, no tablecloths, and chefs bringing out the dishes directly to the diners, the waiters dealing mainly with drinks and clearing away the plates. Music played at a pleasantly subdued level, a selection mainly from 1980s pop, with Tears For Fears and The Cure rubbing shoulders with older tunes from Fleetwood Mac. There are now two tasting menus only on offer, a shorter one priced a $248 (£148) and a lengthier one at $398 (£237). 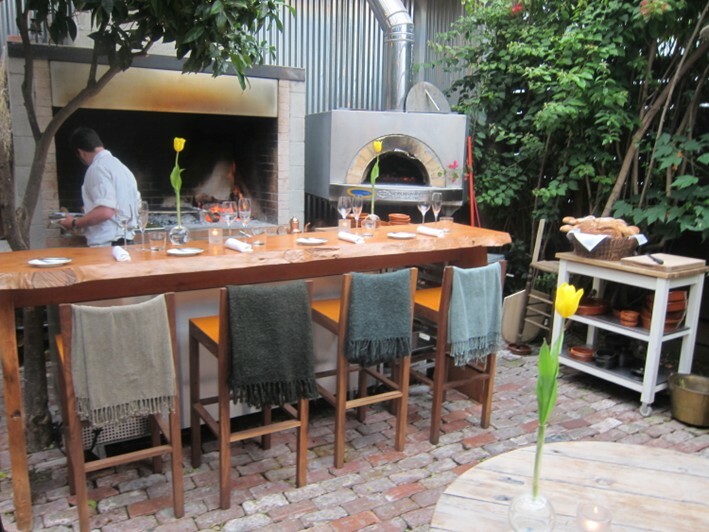 Much of the produce used comes from the restaurant's own farm in nearby Marin county. The wine list comes in two weighty tomes and is vast, with 3,300 labels offered and 22,000 bottles stored. I spotted one wine at $38 but the vast majority of the selection is priced at over $100, with plenty of high-end choices too. The list has considerable depth in France and the USA, but there were wines from much further afield too. Muller-Catoir Haardter 2012 Riesling Trocken was $68 for a wine that retails at around $20, Hirsch Lioco 2009 Pinot Noir was $138 for a wine that you can find in a shop for about $56, Antinori Solaia 1998 was $678 for a wine costing $238 in a shop and Etienne Sauzet Le Montrachet 1999 was $1,938 for a wine that retails at around $660. The meal began with white sturgeon caviar, sturgeon belly cured and smoked on kelp, with bonito and sturgeon jelly made from the grilled fish bones. 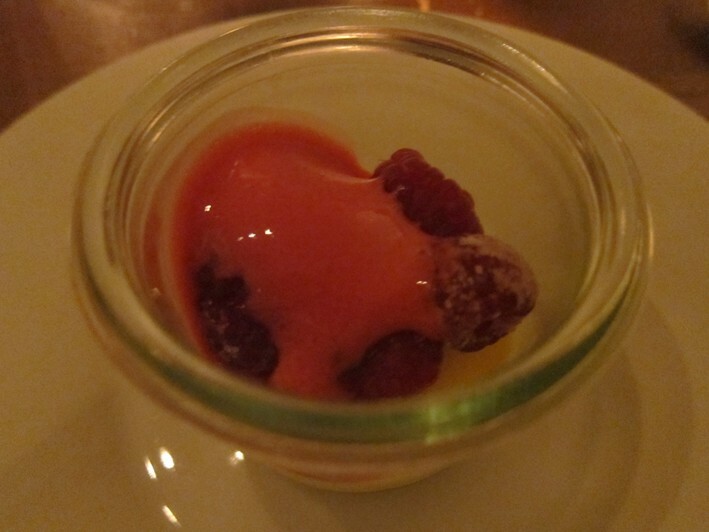 The jelly was excellent, matching the inherent brininess of the caviar nicely (17/20). 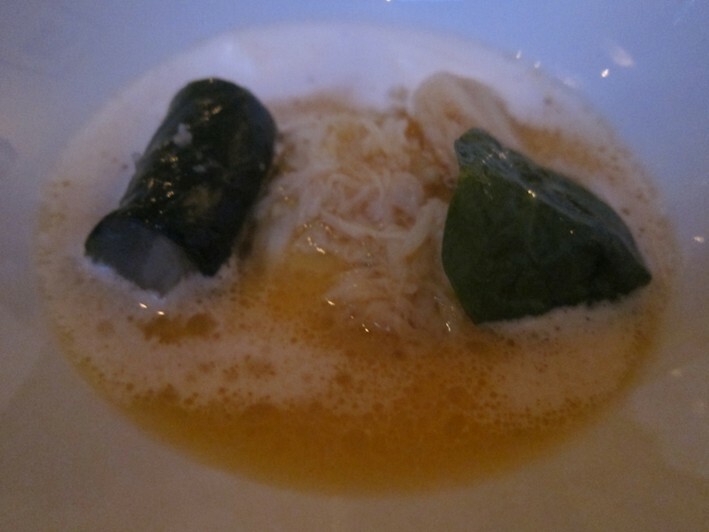 A bouillon of milk thistle with artichoke and scallop had tender scallop and a pleasant freshness of flavour (16/20). Cherry blossom and seaweed was seared over hot coal and served with a shiso (perilla) leaf. This very seasonal dish had delicate flavour (16/20). Golden eye snapper sashimi was next with seaweed and wasabi; this fish is in prime condition at this time of year (I was served it two weeks ago at Sushi Shikon) and it was very pleasant, the wasabi flavour subtle (16/20). 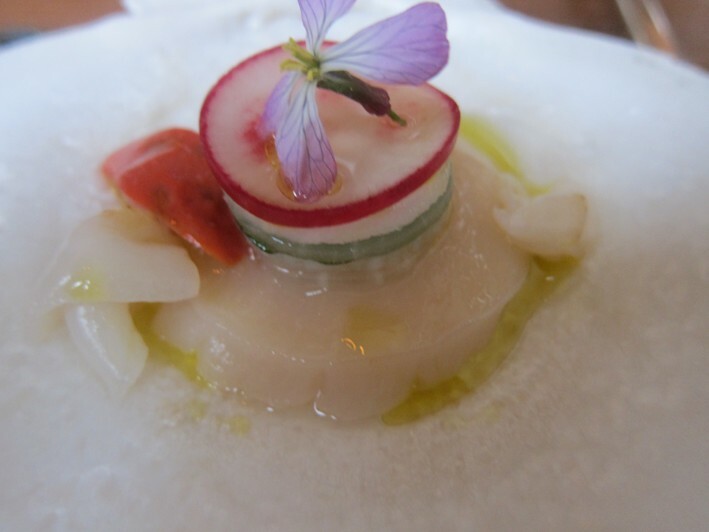 Pickled horse mackerel was served with creme fraiche and the roe of the mackerel alongside pickled vegetables. The vinegar was quite restrained, the fish of good quality (16/20). 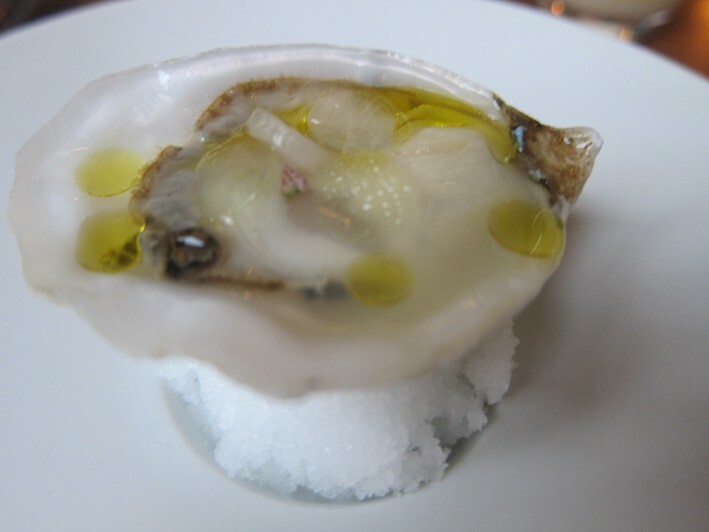 I was impressed by Monterey bay abalone, served with a sauce of its liver and capers. Abalone is a notoriously chewy shellfish, and in Japan is sometimes steamed for many hours to get it to a more pleasant texture. Yet here it is tenderised using only a wooden mallet, working from the center toward the outside. The abalone is grilled for 90 seconds over very hot coals to caramelize the top of the shellfish. Once the inside is just warmed through, the abalone is sliced and dressed with brown butter, lemon, seaweed and olive oil on top of the caper/liver sauce. The result is surprisingly tender (17/20). Sea urchin was local, served on warm bread infused with seaweed; this combination worked well, the bread's texture a nice contrast to the silky sea urchin (17/20). Rainbow trout was hot smoked and served with daikon, the flavor of the trout quite subtle to the point of being elusive (15/20). Golden trout roe was served with avocado and grilled trout bone custard; the avocado was not the best that I have tasted, though the pairing with the roe was logical enough (14/20). Sea cucumber ribs were grilled and served with a sauce made from the salted innards of the sea cucumber with a hint of grapefruit. Sea cucumber can be a challenging ingredient but the treatment here was effective, the citrus effective (15/20). This was followed by crisp sea cucumber chicharron made from the skin dusted in bonito and kelp powder, set with a sauce of egg yolks. The meal progressed to a royale of white asparagus, Douglas fir, roasted pine nuts and mandarin. The asparagus was of good quality, the pairing of flavours quite effective (16/20). Monterey black cod was poached in seawater and served with a Thai style broth with galangal, lemongrass, coconut oil and yoghurt, with shredded kaffir lime and celery, with a garnish of crisp plantain. 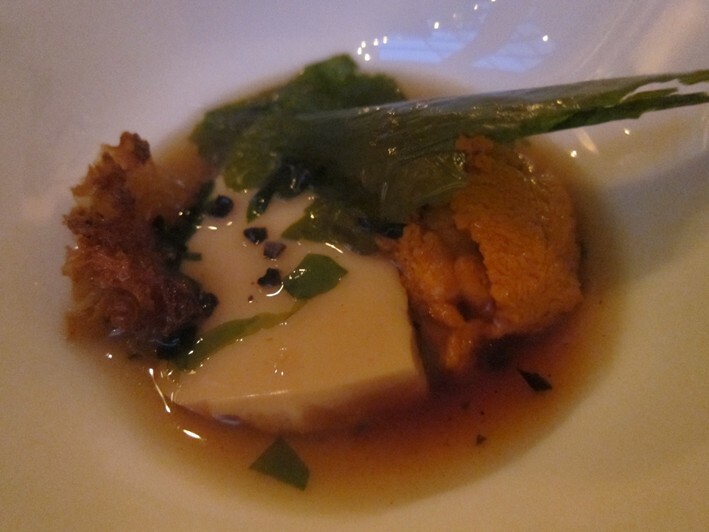 The cod had an unusual, very soft texture from its poaching, and I liked the delicate Asian broth very much, though the plantain seemed to me a bit jarring (16/20). Only at this point did bread appear, but it was worth the wait. A loaf of soft white Parker House bread was made using milk and based on a very old Boston recipe (the pastry chef was apparently from Boston), this particular one avoiding the crisp outside which some versions have. The texture was lovely, pillowy and comforting: classy bread (18/20). 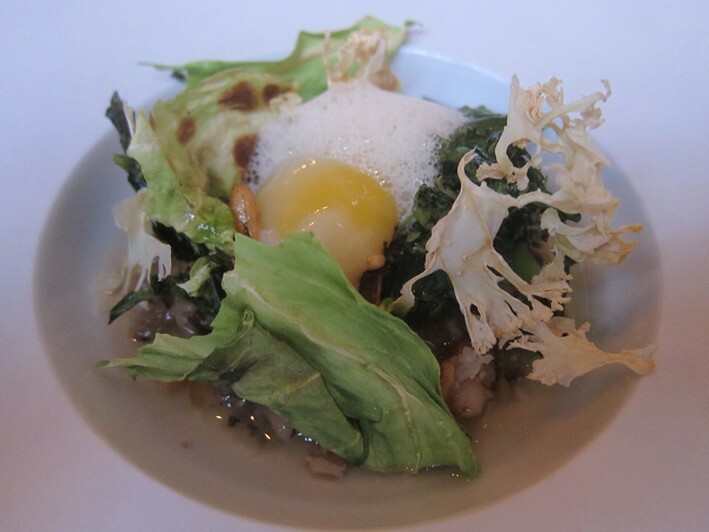 Green asparagus (from Zuckerman Farms in Stockton) came with a sauce of green wild garlic and egg yolk jam. 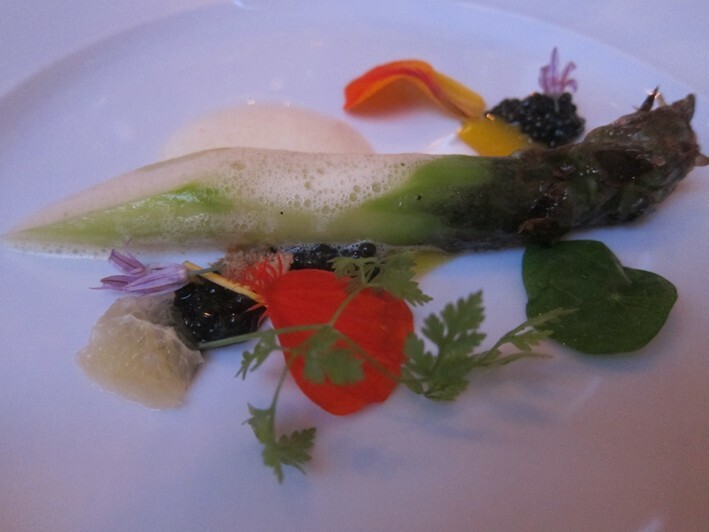 The asparagus itself was excellent, the accompaniments not distracting too much from the lovely core ingredient (17/20). A warm salad was prettily presented and included celeriac poached in smoked water, with an excellent smoked ham and mustard dressing that had a nice citrus hint (17/20). Savoury duck liver toffee came with caramelised white chocolate and layers of milk bread with beer; this was an unusual but very pleasant combination, surprisingly comforting (16/20). A cookie was made from chicken livers poached in saltwater with grilled pecans, honey, mushrooms and duck liver powder. Again this tasted a lot better than it may sound, the sweetness of the honey and the richness of the liver balanced by the nuts (17/20). Morels had been foraged from a site where there had recently been a fire, and did have an unusually smoky flavour note; these were stuffed with duck liver and juniper. 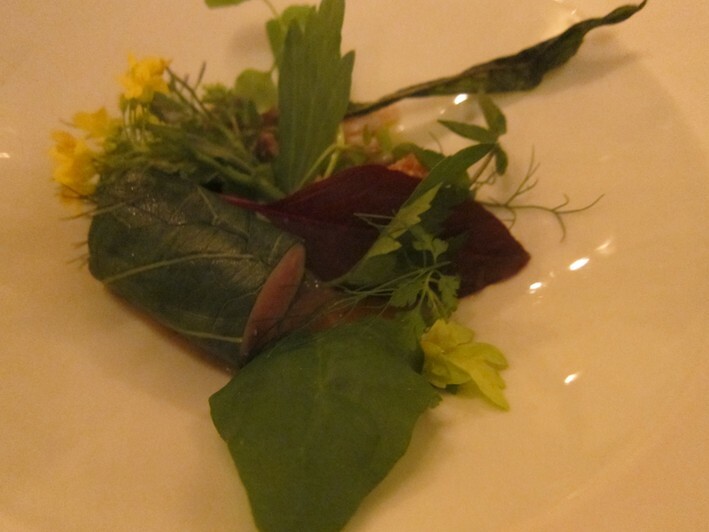 Wood pigeon had been aged for two weeks and was roasted, served with its liver and a sauce made from its cooking juices and sunchoke and sunflower seed butter, acidity being provided by some pear on the side. This was the dish of the meal for me, the pigeon having terrific flavour and the sauce having lovely, deep taste (18/20). 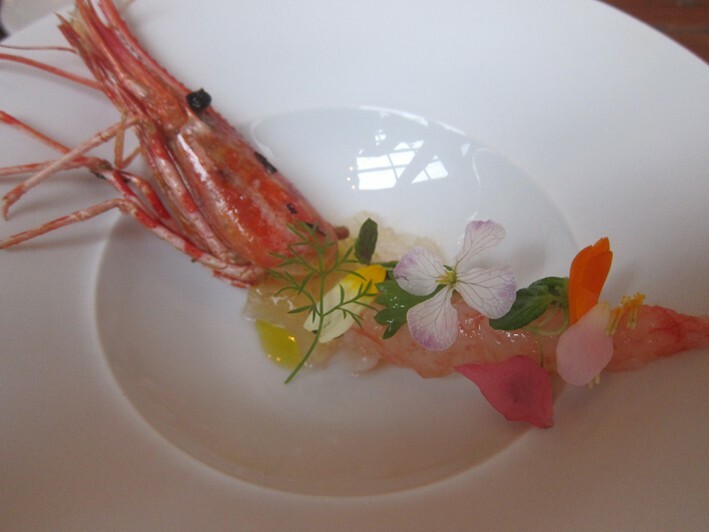 The transition to dessert was marked by a broth of pickled vegetables, herbs and flowers; perhaps this hints at the Japanese tradition of ending the savoury stage of a meal with rice and pickles, though I am not quite sure what this really added. Jasmine, rhubarb, sorrel granita and kumquats were next, a pleasant enough dish but the kumquats were not a patch on some I had eaten recently at Wagyu Takumi (15/20). A soufflé of black walnuts was next, served with black walnut and maple ice cream. 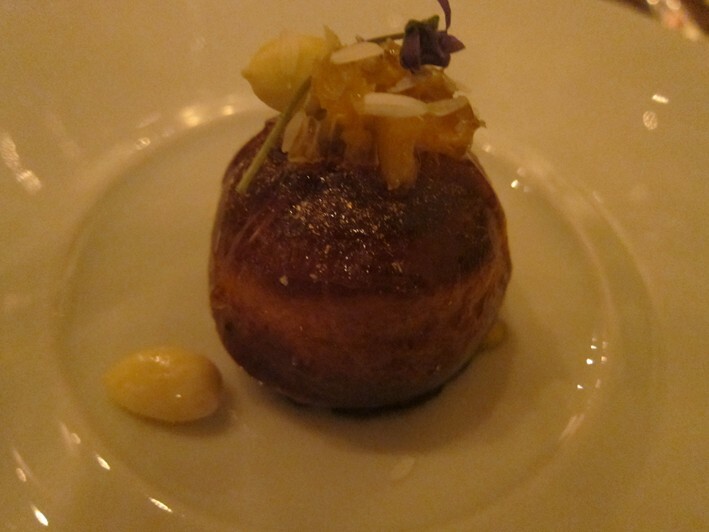 This was rather an oddity: the ice cream was excellent, and I love the flavour of walnuts, so conceptually the dish was fine, but the execution of the soufflé was strange, resulting in an oddly leathery exterior, though it was cooked well enough through inside. This was an odd blip given the otherwise high technical standards otherwise on show throughout this meal (perhaps 14/20 overall). 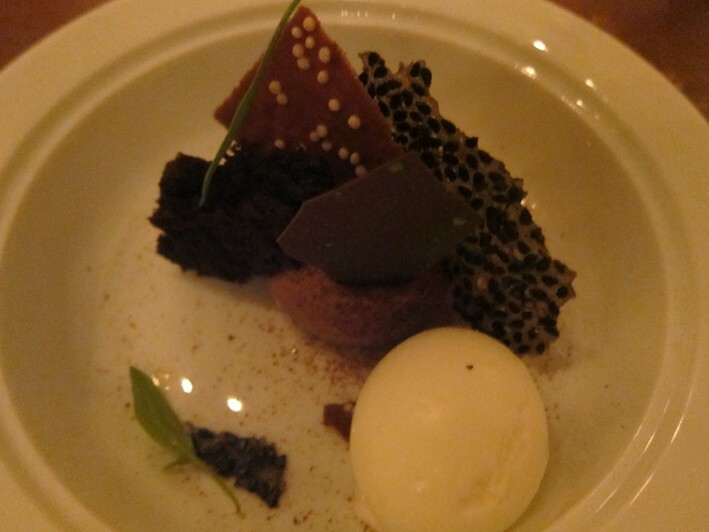 Much better was sourdough ice cream with sourdough crisp, an unusual and very enjoyable combination (17/20). Finally coffee came with petit fours including a peanut truffle and tart of milk chocolate and spearmint. If you had the shorter menu and shared a modest bottle of wine then a typical bill with tip would come to a fraction under £200 a head. Service was impeccable, the staff friendly, knowledgeable and enthusiastic. Overall this was a more enjoyable and assured experience than my previous meal here, the cooking seemingly having settled in to a steadier rhythm in the new premises, with the best dishes this evening, such as the pigeon, being very good indeed. Flavour combinations are frequently unusual but they generally worked very well, and there was an evident emphasis on using high quality ingredients. For me the desserts were not quite to the standard of the savoury dishes, though I will forgive the pastry section a lot for making such lovely bread.